Summary: Both rovers have moved little in the past month, Opportunity because it is in a good science location and because it must save energy during the winter and Curiosity because it is in a geological location so good the scientists appear to almost be going ga-ga over it. 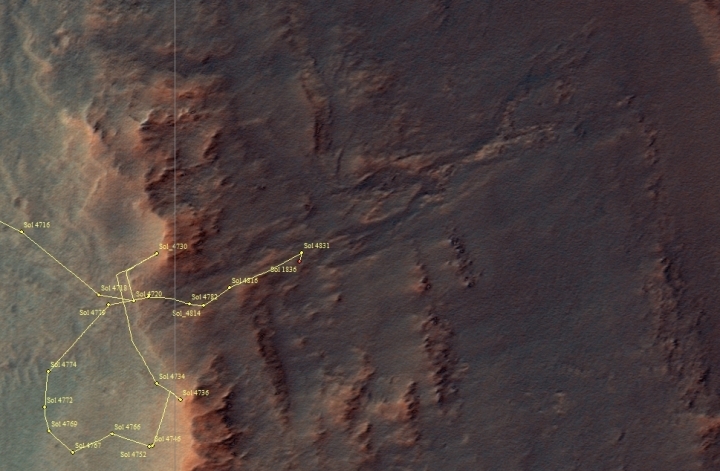 In the month since my December 18 update, Curiosity has continued to head south rather than east as originally planned (as indicated by the dotted yellow line in the traverse map to the right). 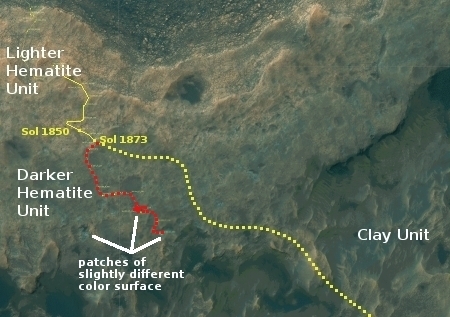 Moreover, the rover has not moved very much, because the science team has decided that there is just too much significant geology in this area on Vera Rubin Ridge, also part of a geological unit they have dubbed the Hematite Unit. This location is a slight depression with exposed fractured bedrock that appears more “blue” from orbit than the surrounding region. In addition, the orbital evidence and observations from the ground suggest that this location is similar to “Region 10” that we visited just last week, which was shown to have some pretty spectacular small-scale features that were of particular interest to many on the science team. As a result, the team was very excited to reach “Region e” and begin our scientific investigation! 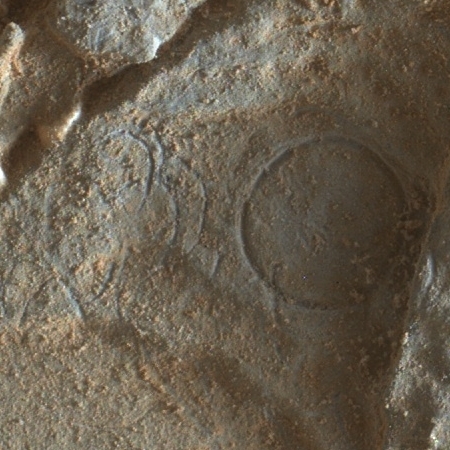 Reader Phil Veerkamp clued me in on one particular intriguing image, taken by Curiosity’s Mars Hand Lens Imager (MAHLI) during this time period. I have posted it on the right, cropping the image to focus on the circular geological features at its center. As I noted to Phil, I have seen circles formed naturally in caves. Water dripping on fine sand will cause a circular splash ring around it. That these features are not all circles does not matter, as splash rings will only look like circles when viewed from directly above. 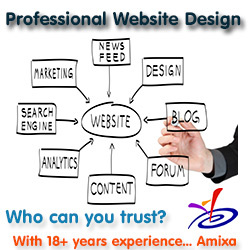 If the ground is uneven they can appear quite distorted from other viewpoints. The curved rings in the image to the right however appear to be a protruding features, not a splash depressions. 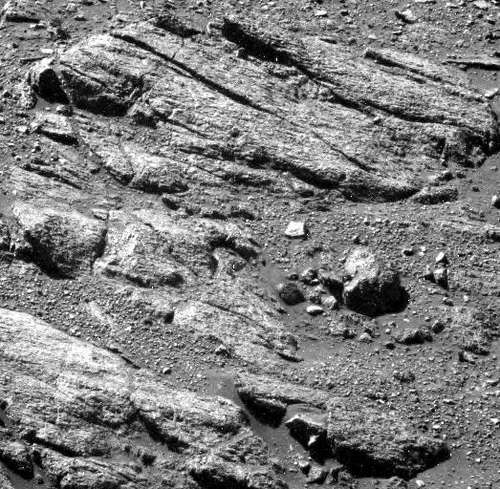 While I can think of a process that would fill in such splash rings with harder material and then leave behind a protruding ring after the fine sand erodes away, I have no idea what geological process would create all these curved features. Moreover, I must remind everyone that I am only an amateur geologist. I am sure the real experts on the Curiosity science team have much better theories. I also am sure that they themselves are also a bit baffled. Not much has changed in the month since my last update Because of the winter season at Opportunity’s location, the rover has limited sunlight available for its batteries. If the scientists move it, they only move it in small increments. One decision has however been reached by the science team. 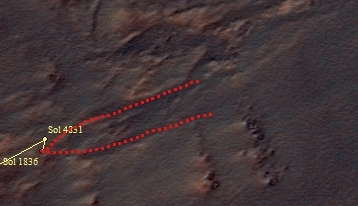 Last month they were trying to decide which of the two routes, as indicated by the red dotted line in the image on the right, they would take down into Perserverance Valley towards the floor of Endeavour Crater. Below is just one image of the many they have taken in recent days. It shows once again the evidence of a consistent directional flow, resembling to my eye slickenslides, features that on Earth are caused by glaciers scrapping on the ground. At the moment however I have been told that the team so far favors wind as the cause of many of these features, though this consensus can of course change with time. So, who is afraid that a $3 billion rover robot operated by a whole team, will take your job? To mix in that absurd economic “debate” against automation and robotization into this. I don’t see Curiosity swear and go getting the sledge hammer to get the stuff fit in the corner, like every craftsman does. It doesn’t even cleanse its little drill from that grain of sand that blocks it. Helpless little robot, and some people think that it is the Skynet end of our civilization. I think we are born with a compartment in our brains that WANT to believe that, and any other doomsday myth, and that some are worse than others to contain this primitive instinct. stated, well before any probe had ever landed there, that Mars would a ruined world, that there would be no civilization there and precious little water. His explanation of why, based on interpretations of myth and folklore, created one of the more miserable episodes in academic tyranny, The Velikovsky Affair, spoken of in the above article. I believe his work deserves a revisit. It is all very good reading, well written and well sourced. No one has ever been able to any more to his theory than the usual cheap “debunking” seen in the treatment of UFO sightings. Check them out if for no other reason than they are fun. I hurried my post and left out odd bits of words.